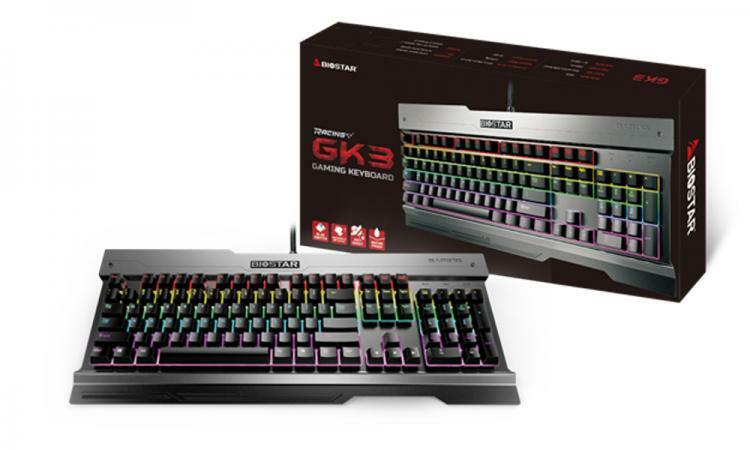 Biostar announces its latest addition to its gaming peripherals – the Biostar GK3 Mechanical Keyboard. The Biostar GK3 mechanical keyboard combines all the essential features gamers need at a very attractable price point. The Biostar GK3 features a very sturdy and durable chassis equipped with an equally durable and responsive switches. Biostar acknowledges the superiority of mechanical keyboards compared to membrane keyboards when it comes to responsiveness and durability. However, it has been a challenge for Biostar to provide gamers with a good value mechanical keyboard. Fortunately, for those who want to step up from the membrane keyboards to mechanical keyboards, Biostar makes the GK3 mechanical keyboard accessible to gamers and enthusiasts with it having an MSRP of $44.99 only! The Biostar GK3 uses OUTEMU blue switches which having a durability rating of 50 million clicks. The GK3 has anti-ghosting capability with a 6 N-key rollover to ensure multiple key presses are captured accurately. The Biostar GK3 also features seven unique illumination modes and lighting which can be configured manually by the user. The GK3 uses a Alps-compatible stems which offers better dust protection even with its large surface area. The OUTEME blue switches in the Biostar GK3 are designed to keep dust away from penetrating the internals of the keyboard. The underside of the internals have a special coating that gives it its waterproofing properties.